You probably know Coyotes big man Paul Bissonnette as an enforcer, and also as some guy from Twitter. But here's what you may not have known about the force known as Biz Nasty: He's earth's greatest hockey player, probably ever. Over Phoenix's stretch of three games in four nights, Bissonnette has racked up three assists—a new season high for the five-year veteran. (Not the scoring streak. The three assists total.) Three points in three games? If Bissonnette keeps this pace up (and hadn't gone scoreless in every other game to start the year), why, that's superstar material and could put him in the Art Ross discussion (if a meteor hits the NHL awards ceremony). "Bissonnette has been getting some greasy assists," says Coyotes scoring leader Mikkel Boedker, clearly hearing footsteps. Just how greasy? Let's examine. On Saturday, in Edmonton, Bissonnette planted himself in traffic in front of the net. 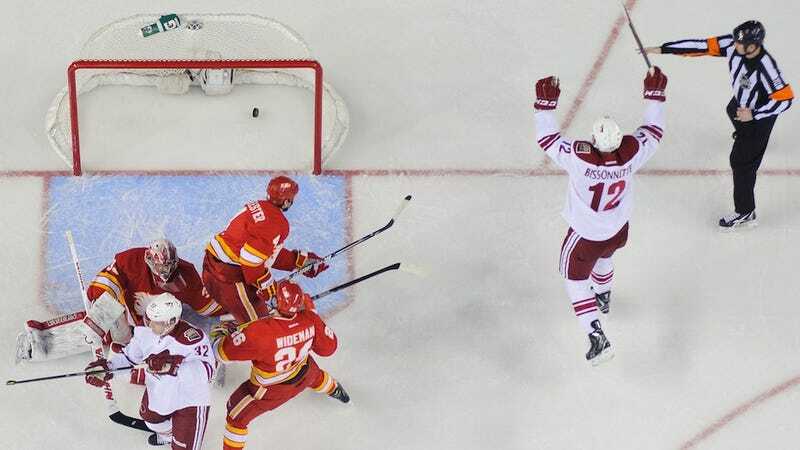 The puck glanced off his stick in the melee, and two Coyotes later, Kyle Chipchura bounced one past Nikolai Khabibulin. Greasy. On Sunday in Calgary, Bissonnette found himself behind the net. He tried to dump it in front, but that failed. He skated it back around, finding Oliver Ekman-Larsson for a shot from the point. Nick Johnson backhanded home the rebound. Greasy. Last night against Vancouver, Bissonnette again found himself with the puck along the boards. He got rid of it within a second, and Kyle Chipchura skated it around front to shovel it past Cory Schneider. Greasy. The NHL is rushing the Paul Bissonnette highlight DVD into stores as we speak. Its runtime will be 62 minutes and five seconds, which, not coincidentally, is Bissonnette's total ice time this year.